Now you can be a Doctor Who fan that owns a 13th Doctor figurine. The first female Doctor Who is a great reason to own a figure of her. 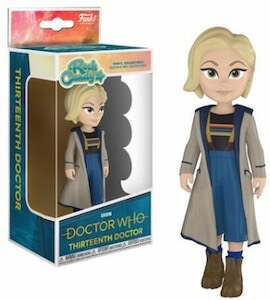 And the people of Funko are making this 13th Doctor figurine in the Rock Candy series and she is about 5 inches tall and looks just like we know she does with her long coat and striped shirt. If you have all the Doctors as figures then missing the 13th Doctor Who is something that should not be happing so make sure you get your own female Doctor Who now. 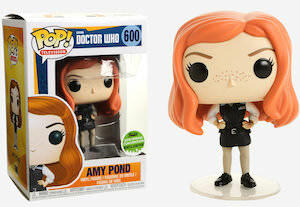 Now there is a cute Amy Pond figurine that you just need to get. The figurine is number 600 in the Funko Pop! series and that means Amy is 3 3/4 inches tall and has a nice big head with red hair and freckles and she is wearing the police uniform that we have seen her wear all the way in the beginning when she first met the 11th Doctor. The Amy Pond vinyl figurine is a 2018 spring convention edition and that could mean that it really is limited so if you are a true collector you just need to make sure you get your own figure. If you like Doctor Who and action figures then you have to check out this 4th Doctor Playmobil action figure. The figure looks like a classic Playmobil figure but this one is bigger then the classic figures. The Doctor Who action figure is 6 inches tall and comes with his famous scarf and wears the famous hat too and yes the Doctor has his own Sonic Screwdriver too just like the real Doctor has. 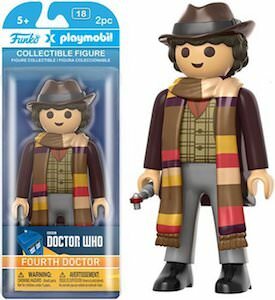 This Doctor Who figure is made by Funko and Playmobil so you know it looks just like you want it to and it is rated ages 5+ and that means even the kids can play with it. Now there is a Playmobil action figure that looks like the 11th Doctor Who and that is what every Whovian wants. 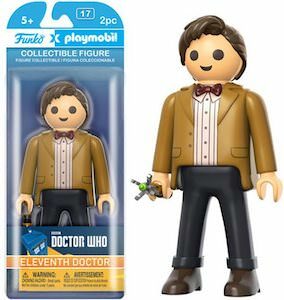 This figure of the 11th Doctor is just like a classic Playmobil character only bigger as the Doctor is 6 inches tall and made in a collaboration between Funko and Playmobil. As you can see on the picture the Playmobil character looks just like the real Doctor Who complete with his jacket and bow tie and he did bring his own Sonic Screwdriver. This classic action figure is rated ages 5 and up and would be a great collector’s item and toy at the same time. John Hurt was the War Doctor and passing to the next dimension makes this Doctor Who figurine just what you need. 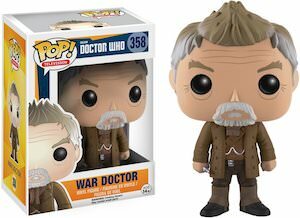 This Funko figurine is the War Doctor just like we seen him in the 50th Anniversary episode of Doctor Who and he is just like on the TV. The War Doctor figurine is number 358 in the series and comes in a cool box that you could keep him in if you like you toys to look new. Any true Doctor Who collector should have a War Doctor figurine and this 3 3/4 inch one is the perfect size for any collection. Now you can own the 12th Doctor while he is rocking. This is a pop! 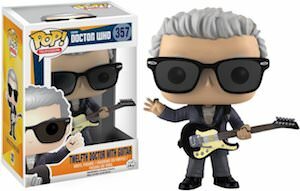 figurine of the 12th Doctor Who and this time he is wearing his sonic sunglasses and playing the guitar. This is a 3 3/4 inches tall figurine in the Pop! series from Funko and it is numbered with 357. Like all the Pop! Vinyl figurines this Doctor Who one also comes in a cool windowed box so that you can keep him in a new state or just unwrap the Doctor and have him stand on display in your home or maybe even the office. If you are a Doctor Who figurine collector then you need this figurine of the 11th Doctor as it is really special. The figurine is not just the 11th Doctor, inside him, you also find Mr Clever and you can see some Cybermen details to his body. A unique figurine like this can’t be missing in your collection. At 3 3/4 inch tall Mr Clever is just like most Pop! of the figurine’s made by Funko and the box has number 356 and is windowed so that you can keep the invaded Doctor inside the box to limit contamination with other figurines. Now you can own a Rose Tyler figurine and that of course is something any Doctor Who fan wants. This is a figurine of the companion that had so many adventures with the 9th and 10th Doctor is just something you need and yes Rose is blond just like the real girl and is wearing some fun clothes just like you can expect for her. 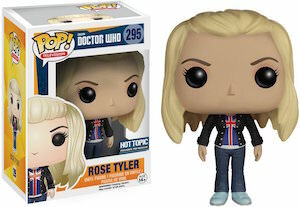 The Rose Tyler figurine is part of the Pop! Vinyl series from Funko and the box has number 295 on it and is a windowed box so that you can see Rose without having to unpack this Doctor Who companion. 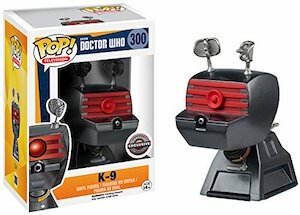 Now K-9 can be part of your Doctor Who collection. This figurine of K-9is part of the Pop! collection of Funko and it’s marked as number 300. This K-9 robot dog is 3.75 inch tall like all th other Pop! Vinyl figurines and is just cute and a must have. The robot dog comes in a nice window box so that you can see him while it’s still wrapped up. Of course K-9 loves to be around the Doctor’s and other character of the series and would love to live in a new home and is hoping it could be yours. Now you can own your little Doctor Who that will bring light to the dark. This Doctor Who figurine glows in the dark and looks like the 10th Doctor just after his regeneration as he still is wearing the 9th Doctor’s clothing so he is all in black but still holding on to his Sonic Screwdriver. This 3 3/4 inch figurine is part of the Pop! 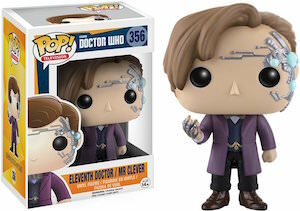 Vinyl series from Funko and this figure is really exclusive so not likely going to be found in store and that of course makes it even more special then other figurines of Doctor Who.